Region: This weevil can be found throughout eastern and central North America. Life cycle: This insect produces two generations each year and overwinters as an adult in grass or garden debris immediately adjacent to carrot fields. Physical Description: This weevil is similar to the Vegetable Weevil and is 1/5 of an inch long, dark brown to coppery with a hard shell. Feeding characteristics: This pest attacks carrot, celery, dill, parsley, and parsnip plants by boring into the tops of the carrot roots or directly into the carrot heart. They destroy most of the plant's tissue by traversing back and forth in a zigzag pattern. 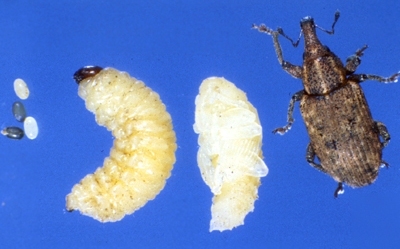 Controls: If debris, high grass, weedy areas next to crops or gardens are clean up, the weevil won't be able to find a cozy place to overwinter. In addition, Crop rotation is helpful in the prevention of this insect. In the spring, destroy any grubs in the soil by a deep cultivation in the area where you will be planting.